If Jeff Kushner's material hits us in the Nuggets, then Zoo Story hits us in the Children of Nuggets. We were blown away by the first Zoo Story tape we posted last year, so we're pleased to be picking up the full story and presenting their real first tape. Cathie Hahnel was an old friend I first met when I was “Ramblin’ Greg” on Friday nights CJSW. We decided we’d have a go at starting a band, but we needed a drummer. So – seriously – we put an ad in the Bargain Finder! After a few false starts, we heard from Gary Brown. We set up in his basement. It was the first time for any of us to be playing our particular instrument in a band context – I was guitar, Cathie bass and Gary drums, so we sounded pretty ragged at first, but songs started to come together. Meanwhile, Gary had all these friends in the Calgary ‘A-List’ music scene, so one night, we were invited by the Sailcats to play a couple of tunes between sets at Greek Eatery ‘Orestes’! Wow – opportunity knocks! 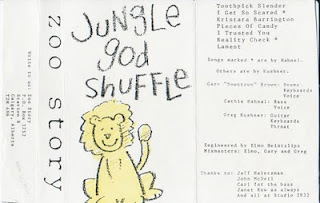 Far from mocking us, the Sailcats and others were very positive and encouraging – to the point that a couple of them set up the recording gear and recorded our first tape “Jungle God Shuffle” which is why it sounds so slick. I still dunno why “Kristara” particularly appealed to people. There’s a remixed version of that tune that Gary submitted to KIK FM – We contrast quite sharply with the bands played before and after us! Not to knock "Kristara Barrington," but it is curious that it's had such a strong pull for so many folks - our favourite track on here is "Pieces of Candy," reworked from its original Unsightly version. But then, we've always been more obscure in our choices.